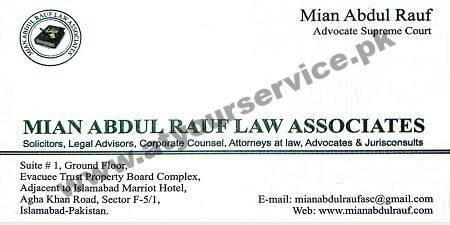 Mian Abdul Rauf Law Associates is a well reputed Law Concern. We deal with Commercial Law, Civil Law, Constitutional Law, Human Rights issues, International / Domestic Humanitarian issues, Maritime & Admiralty Jurisdictions, Services and Labor ventures. We provide Administrative Law services to numerous institutions including Banks, DFIs, FMOs, Corporations, Companies and leading organizations to ensure maintenance of their smooth business operation, mergers and amalgamations etc.